PITTSBURGH – The Pittsburgh Business Show is pleased to announce the return of The Pittsburgh Women’s Mastermind™ (PMW) as a sponsor for the Women Who Embrace Life Conference being held on May 14 and 15 at the David L. Lawrence Convention Center. “The Pittsburgh Women’s Mastermind™ is honored to be a sponsor again for the 2019 Pittsburgh Business Show,” said Pittsburgh Women’s Mastermind™ President, Melanie Colusci. Colusci and the PMW will host an exclusive Networking Luncheon for Women on May 15 at Noon during the Pittsburgh Business Show. “This luncheon is for women in business or women thinking about starting a business. Our goal is to provide a unique opportunity for women to get to know other business owners, share information, and discover new business opportunities around the Pittsburgh area,” Colusci said. Pittsburgh Women’s Mastermind™ supports the personal and professional growth of women entrepreneurs through its network of like-minded, ambitious, and approachable women who are on a journey to take their businesses to the next level and help other women do the same. PWM holds monthly live meetings, community calls, and events to provide their members with valuable networking opportunities, educational content, and professional development tools to help them advance their business and thrive. PWM is led by Melanie Colusci, award-winning Pittsburgh business owner and founder of PWM’s parent brand, From Start-Up to Success. As part of the show’s events and activities, PWM’s parent brand, From Start-Up To Success, also owned by Colusci, will host workshops in booth #222 to help attendees learn how to network successfully, leverage non-verbal communication in business interactions, and utilize strategic marketing practices. As a sponsor of the Pittsburgh Business Show, proceeds from discounted tickets purchased for the Pittsburgh Business Show using this link will be donated to support the Women’s Center & Shelter of Greater Pittsburgh in honor of the Pittsburgh Women’s Mastermind Organization. If you would like to purchase tickets for this exclusive luncheon purchase those tickets here. The Pittsburgh Business Show features a variety of networking events, workshops, and speaker sessions you can attend to gain valuable information and insight into the business community of Pittsburgh. 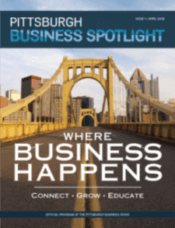 Attend this event and more at the Pittsburgh Business Show on May 14 and 15. If you would like to purchase tickets for this exclusive luncheon purchase those tickets here.